Walking the dogs yesterday morning, I looked down at my hand and was faced with a fluorescent, almost grey hand. It was not a pretty sight! As soon as I got home, I rummaged around to pick out some of my favourite tanning products. These trusty three have never let me down, so now, when I’m at my palest, I’m bringing out the big guns! 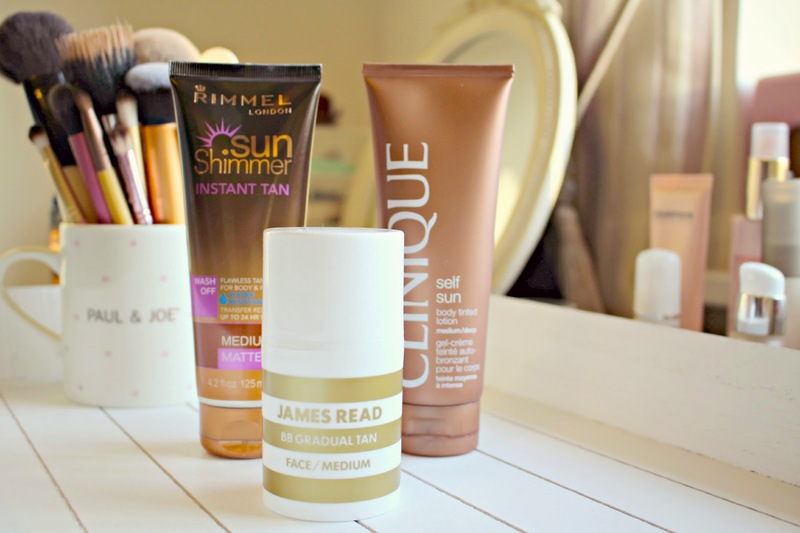 Each product has a different advantage; they are the Rimmel Sun Shimmer Instant Tan, Clinique’s Self Sun, and James Read BB Gradual Tan for Face. The Rimmel Sun Shimmer Instant Tan, as you can guess, gives you a tan within seconds of application, so ideal if you’re in a rush. I’ll put a walnut sized amount on a tanning mitt and start from my shins, quickly work my way up each leg, using circular movements to ensure even coverage. You can build it up, but I usually do just one layer. I can’t figure out how it manages to be waterproof and also wash off at the same time, and luckily I’ve never been caught in a rain storm so can’t comment on how waterproof it is, but while the tan itself is absolutely lovely, I do find it quite tricky to remove, often getting a little patchy if I don’t scrub it off properly in the shower! Overall though, it’s a really fab tan and the best part is, it’s less than £5 (currently!) from Boots! When I’ve got a little more time, I’ll use Clinique’s Self Sun which develops a golden tan in a few hours. There is a guide colour, but I’ll usually leave the tan to develop until it’s a little darker, have a quick shower and then dress, that way there’s no chance of any fake tan smell! I find the Clinique is a little more natural looking than the Rimmel, and so it should be as it’s almost 4 times the price! For special occasions and times when you can afford to spend a little longer on getting the perfect tan, the Clinique is my go-to tanning product. It’s £19.00, available from the Clinique website here. For my face, i’ll now only use the James Read BB Gradual Tan which gives an even tan, a lovely glow, and also contains ingredients which aid cell-renewal and skin hydration. You immediately get a light golden glow, but also the gradual tan builds up to give a deeper glow. I usually use it up to three times a week and exfoliate just as often to maintain an even glow. My top tip would be to make sure you do NOT apply straight after showering, you don’t want the tan getting into your pores as it will make them look darker. James Read even recommends rubbing an ice cube over your skin before application to ensure they are fully sealed. It’s £20.50, available from BeautyMart at Harvey Nics here. Have you tried any of these tanning products before? What are your favourite tanning products to use in Winter?